2018 was an excellent year, if not quite as excellent as experts predicted at the outset. 2019 will also be excellent, if, perhaps, somewhat less so than the year that preceded it. After that, things will taper off, but it won’t be another end of the world scenario. 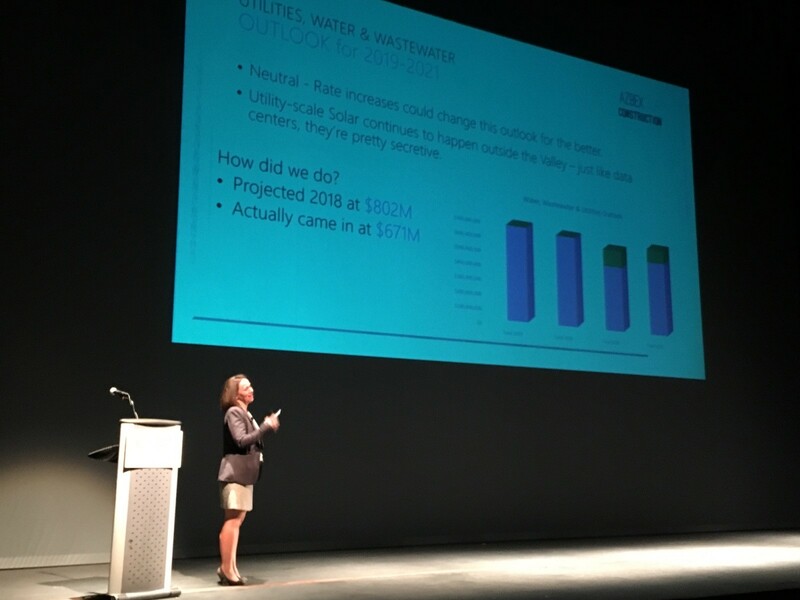 Such was the theme of the AZBEX 2019 Construction Activity Forecast, held Jan. 10 at the Tempe Center for the Arts. If any of the nearly 300 attendees came expecting bombshell developments about the construction market as a whole or its constituent sectors as areas of specialized interest, they would have left disappointed. If they were not there as thrill seekers hoping for a wild ride up or down, they left reassured and, perhaps, even optimistic about the year to come. Morris kicked off the event by recapping the major economic indicators facing the market, including the much-publicized population growth in the state. From 2004-2006 rates all exceeded 3 percent. During the bleak times of 2009-2010, growth was sub-5 percent, but has since recovered to a leading, but still temperate 1.5 percent-plus for 2017-2018. As the population has grown, so has the opportunity for residents to find jobs. Projected 2018 employment numbers for Arizona show 2.937M jobs around the state, a 9.6 percent increase over the 2007 pre-recession peak of 2.7M. One number that can read as simultaneously positive and negative, however, is the state of construction employment. There are currently 169,400 construction jobs around Arizona, and the state’s employment in this sector is consistently at or near the top around the country. However, the boffo construction employment number is still 29.6 percent less than the boom era (2006) peak of 240,300. This is healthy, overall, Morris pointed out, because it demonstrates the Arizona economy has diversified and is no longer nearly as dependent upon construction and development as it was leading up to the crash. As Morris previously pointed out in a Sept. 2017 article comparing construction and activity data at that point versus the pre-recession peak, however, “We’re all busy, but we’re only doing 44 percent of the work we were in 2006, and we’re doing it with only 56 percent of the people.” (AZBEX; Sept. 15, 2017). While the total projected construction activity for 2018 is $13B, that remains a 40 percent dip from the 2006 peak of $21.67B. Another area of market interest and evolution is the volume of public projects receiving bids in excess, sometimes far in excess, of the provided engineer’s estimates. Using historical and current data, Morris pointed out both the overall number of projects being bid higher than estimates and the dollar amounts of the differences have both been progressively increasing. The challenges facing the industry are largely the same as have been noted for the past few years: An ongoing shortage of skilled labor that provides a shallower pool of workers across the board and reduces the efficiency of completing project-related duties; federal-level uncertainty in the areas of public/infrastructure project funding and trade policy, and rising materials costs. A new potential project pitfall for 2018 and continuing into the foreseeable future is resident pushback against planned projects. Political and social upheaval have made people feel more empowered and inclined to speak out, and whether it’s a transportation project that’s been on the books for decades or a light industrial project fully in line with established zoning, if residents feel inclined to oppose it, they’re more likely to speak out loudly and complicate the process, Morris said. Looking at the various market sectors AZBEX tracked, the 2018 actual numbers were almost universally less than those projected at last year’s inaugural forecast event. “We were a little optimistic,” Morris said, “but we had cause to be.” She pointed out that market factors such as costs and labor were contributors to delaying projects, which led to lower gross output, but that no sector was hurting for any kind of work volume. AZBEX turned out to be in good company with its 2018 expectations versus reality and for its overall 2019 assessment for a more sedate but still strong development market. The next morning at the 10th Annual AZ Dealmakers Conference, single-family real estate guru, Jim Belfiore, and go-to economics expert Elliot D. Pollack, both noted similar disparities and explanations in their own market recap presentations. In summarizing the analyses of the various market sectors and their activities, AZBEX’s findings largely reflected those of experts focusing on construction as a whole and those specializing in its various subcategories: There is opportunity across the board from a diverse set of players in each sector, and 2019 will likely be the last year of growth in this cycle, with mild declines projected for 2020 and 2021. Why Incentivize When There’s Nothing to Buy? Nonres. Const. Maintains Momentum in Dec.